Waiting in line for almost the entire day just to get government documents were something of a norm back in the day. But it’s a need for a job, or for school, hence the perseverance to stand and wait in queue, wait for one’s turn to get authentic certificates, like one’s NSO Birth certificate. Believe it or not, many people have been on the same boat, and have expressed their frustrations and distaste for the old ways. With no choice, and the painstaking patience to wait, some even end up on the counter only to be told that they reached the cutoff and would need to go back the very next day. Other than it being downright frustrating, it is also expensive and time-consuming, with many of us having more things to do. However, things are about to change for the better, as The National Statistics Office, now named Philippine Statistics Authority, is looking into more convenient ways to process desired documents by means of the online route. Yes, we are in luck! The PSA together with Pilipinas Teleserv has launched websites and call center agencies to cater for applications online! 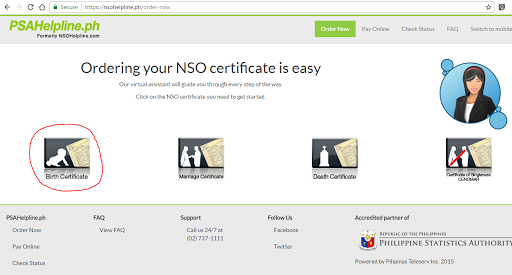 With the online sites, you can apply for NSO/PSA certificates without the hassle of physical lines! 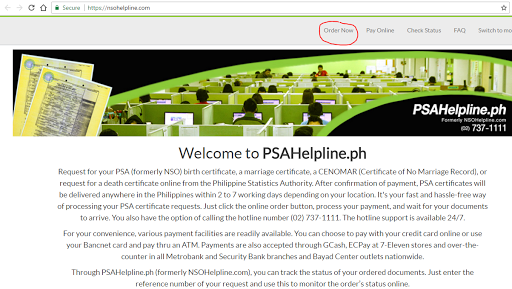 You can now cue in the online or hotline queue with these two official websites for NSO certificate processing: Unisys Philippines’ e-Census, and Pilipinas Teleserv Inc.’s PSAHelpline.ph. Now there are three rather simple steps for NSO certificate requests (if you go through the NSO Help Line site): First one is Order Now, second one is Pay Online and the third is Check Status. 1. Go to PSAHelpline.ph (or www.nsohelpline.com). Once you load the webpage, click on section that reads Order Now. You will be presented a Certification Application Form. Be sure to fill it out completely before clicking Continue. Note: For legal proceedings, you may be undergoing such as adoption, legitimation, so on and so forth, select the next step after the form. If not, then choose “None”. Next, enter recipient’s name or the person receiving the requested certificate. Click Submit. Be sure to thoroughly check your order summary found on the left side of the screen. On the right, enter your contact information and address on which you wish the document to be delivered in. 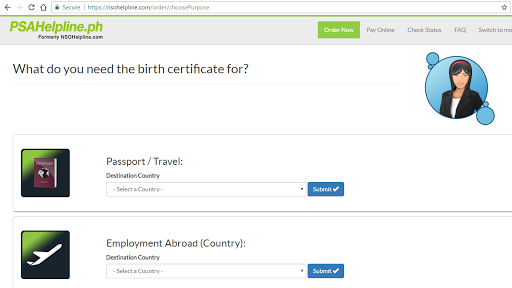 Under Check out Summary, tick every checkbox for certifying all entries and then click Continue. Almost there! Now you just need to confirm your Pay Order. You do this by selecting the following methods: Over the Counter payment via Metrobank or the Bayad Center; Online for VISA or Mastercard holders; BancNet ATM; Mobile payments via Globe Gcash. After confirming your request for your desired document (the NSO certificate) through payment, you may check your order status in the Check Status page! Be sure to have your Reference Number in hand, so that you can enter the RN in the page. According to NSO Helpline, you can expect your requested order of document within 2-3 business days! Remember! If ever you or the recipient are not available or in the specified address during the delivery, be sure to have a copy of a Letter of Authorization provided on the website for verification. Be sure to have the name of your representative that will be receiving the document for you, and then have your signature on it. Be sure that your representative has at least one valid ID in hand! Easy right? No more lines, no more queues. 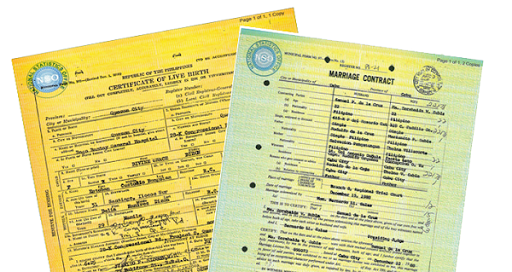 Get your NSO/PSA certificates online!